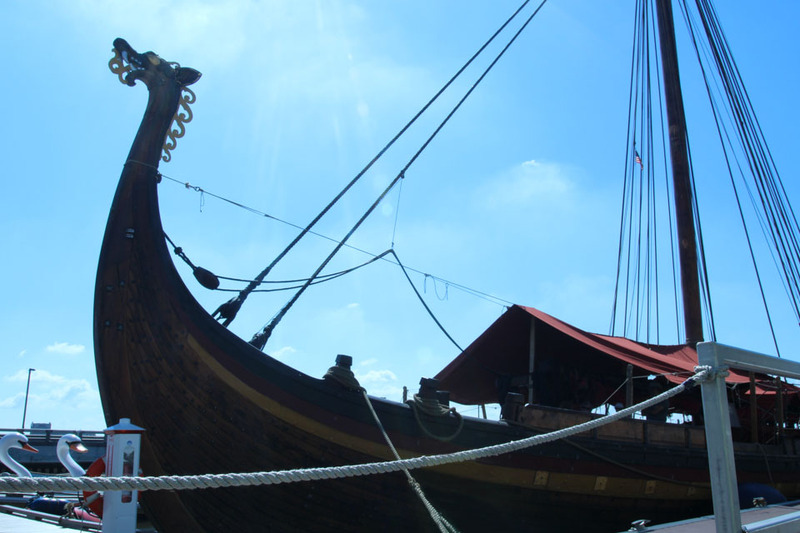 Longtime fans of Thor and Loki would pounce at the opportunity to tour a Viking ship. But where do you find an actual ship when the Viking era ended hundreds of years ago? Luckily for us here in Philadelphia, the Draken Harald Harfagre recently made its much-anticipated appearance at Penn’s Landing during their 2018 East Coast Tour. Stretching out 115 feet long, the formidable and gorgeously crafted Draken is the largest recreation of a Viking ship in modern times. Commissioned in Norway in 2010, the Draken took a skilled team of craftsmen and historians two-and-a-half years to build. They drew on ancient Viking and Norse shipbuilding techniques to make it as authentic as possible. It fits 100 oarsmen. When you step on board the Draken, it feels like you’ve been transported back in time. The thick floorboards—handcrafted timbers sourced from Norwegian forests—shift under your feet as you make your way down the length of the narrow ship. Traditional Viking warships, like the Draken, were narrow with shallow hulls for speed and maneuverability. This proved to be very useful for navigating small rivers throughout Europe for potential raids. Thick ropes coated in pine tar stretch from the side of the ship to the blood-red sail, which would strike fear in the hearts of Europeans everywhere during the Viking era. A fierce dragon head adorns the front end of the ship; in Norse mythology, dragons kept evil spirits away. Another protector of the ship are two cast-iron ravens, Hugin and Munin, who were Odin’s aids. They would gather important information for the god of war, and Norsemen would often offer sacrifices to these birds in battle. The Draken team has built a gully in the center of the ship for the thirty-four crewmembers on board. It contains sleeping areas, a small kitchen, and a bathroom. Traditionally, Viking warriors would just sleep on the flat deck at night. Since the Vikings were exceptionally skilled at shipbuilding, there were other types of ships of course. Large merchant ships, called knarrs, could carry up to forty tons of goods. They were much broader and sturdier than warships because they had to withstand long months at sea. Smaller merchant ships, called byrdings, were light enough to maneuver through channels of water toward Eastern Europe. Small, simple boats were used for day-to-day life; people used them to fish as well as transport people, goods, and local news. Essentially, Viking shipbuilding launched the Viking era. Without these skills, the Vikings would not have expanded as rapidly or successfully. While we still don’t know much as there’s only been a handful of discovered Viking ships, our current knowledge of the art of Viking shipbuilding is currently going through a resurgence in Norway and Denmark. But if you missed the arrival of the Draken Harald Harfagre, don’t worry! The Vikings are paying a much longer visit at The Franklin Institute this October. Make sure to buy a ticket to our upcoming exhibit, Vikings: Beyond the Legend, to immerse yourself in their captivating world! Christine Quach is a Digital Media Intern at The Franklin Institute science museum in Philadelphia. She is currently pursuing a B.A. in Journalism at Temple University.